Abby-Roo and Belka were honored to have their pigures chosen for the Pet Piggies on Parade 2013 calendar! We were all excited to see the calendar in our mailbox earlier this week. 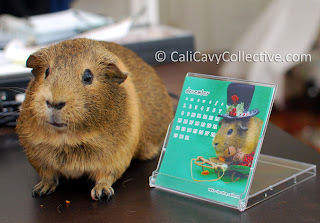 Available here, the mini desk calendar features different CavyMadness community members guinea pigs on each page. 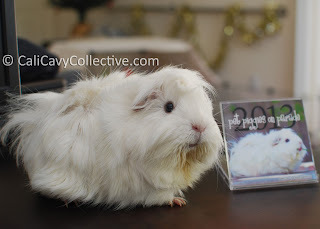 Abby-Roo, her pink piggy tongue, and a hapless blade of grass are pictured on the cover while festive Belka perched on a pig sized sled is the December Peeg. Our favorite was the anonymous pig for March, who was captured sitting amid a verdant patch of clovers. This would make a lovely gift. Cute cavies on every page! Nice, you look great girls!